Diabetes affects many people each year, including seniors. Aging adults are at higher risk of developing diabetes due to inactivity and poor eating habits. Here are some of the foods older adults should avoid eating to decrease their risk of developing diabetes. Sweet treats lack nutritional value and increase blood sugar levels, leading to weight gain, which can cause diabetes. Instead of eating cakes, donuts, cookies, and other low-quality carbohydrates, your senior loved one should eat fresh fruits. Berries, apples, and other healthy fruits slow the absorption of glucose, helping seniors control their blood sugar levels. If your senior loved one has been diagnosed with a serious condition and needs help with tasks like meal prep, transportation, bathing, and grooming, reach out to Home Care Assistance, a leading provider of home care Montgomery, AL, families can trust. We also offer comprehensive care for seniors with dementia, Alzheimer’s, and Parkinson’s. Bacon may be a popular breakfast item, but it is one of the unhealthiest food choices for seniors. The saturated fat found in bacon can cause inflammation and other issues that lead to diabetes. Inflammation causes insulin resistance, raising blood sugar. As a result, older adults could develop type 2 diabetes. Instead of eating bacon and other high-fat meats like bologna and hot dogs, aging adults should eat turkey, shellfish, and skinless chicken. Refined starches are made with white flour, which acts like sugar once the foods are digested. Eating white bread interferes with the body’s ability to control glucose, increasing the odds of developing diabetes. Instead of eating white bread, pasta, white rice, and other refined starches, older adults should consume barley, brown rice, whole-wheat bread, and whole-grain starches that elevate their glucose levels. 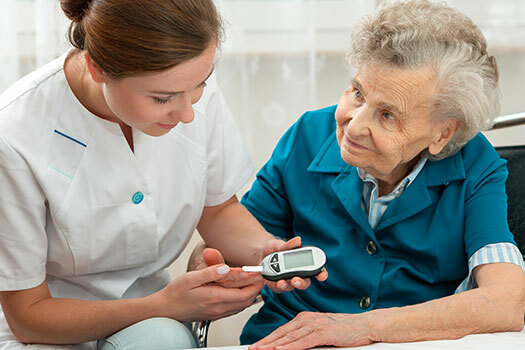 Caring for an aging adult with diabetes can be overwhelming. If you are the primary caregiver for a senior loved one in Montgomery, respite care is available when you need time away from your important caregiving duties. At Home Care Assistance, our respite caregivers are available 24 hours a day, 7 days a week to help your loved one manage everyday tasks in the comfort of home while you have the chance to take a much-needed break. Many people believe pretzels are a wholesome snack, but the sodium, white flour, and corn syrup found in pretzels can increase the risk of diabetes in older adults. Although pretzels are baked instead of being fried like most potato chips, the refined carbohydrates still raise blood sugar levels. Pretzels do little to satisfy the appetite, causing aging adults to overeat. Instead of eating pretzels, your loved one can snack on nuts, nonfat yogurt, or rice cakes, as these snacks are filling and contain protein, which balances blood sugar. These refined oils put seniors at risk of obesity, inflammation, cardiovascular issues, and diabetes. Corn and soybean oils are industrial oils that increase fat consumption in older adults. Avoid using butter when cooking for your loved one. The best oils for aging adults are lavender, avocado, and olive oils. These oils protect the body from oxidative stress, prevent high blood sugar levels, and lower the risk of diabetes. Older adults should drink water, unsweetened teas, sugar-free juices, and other healthy non-alcoholic beverages. Sugary beverages such as sodas, lemonade, and sweetened tea can increase the risk of developing diabetes because of the high levels of sugar in the drinks. The beverages can cause insulin resistance and reduce the ability to respond to the insulin hormone. If your elderly loved one is living with a serious medical condition and needs help managing the tasks of daily living, reach out to Home Care Assistance, a Montgomery home care agency you can trust. Our caregivers are available 24/7, there are no hidden fees in our contracts, and we offer a 100% satisfaction guarantee on all of our in-home care services. To learn more about our in-home care plans, call one of our Care Managers at (334) 593-3988 today.